Charter buses filled with NBA players and volunteers lined the street alongside William Hart Elementary School here on Friday. The school was the first of three locations where players participated in community service projects during NBA All-Star Weekend. This year marks the 10th anniversary of the NBA Cares All-Star Day of Service in which athletes, coaches, and volunteers help rebuild communities in the All-Star Game’s host city. This year’s service sites included schools, individual families in need, and families affected by a Feb. 7 tornado that ripped several neighborhoods in New Orleans East, destroying many houses that had been rebuilt after Hurricane Katrina in 2005. On this blustery, 59-degree day in Gretna, a city less than five miles outside of the heart of New Orleans, the goal was to help construct the school’s playground with nonprofit organization KaBoom! Steph Curry laughs as he exits a volunteer event at William Hart Elementary School. NBA players volunteer their time to help better the New Orleans community through the NBA Cares program. Even as the athletes, including Stephen Curry, Kevin Durant, DeMarcus Cousins, DeAndre Jordan, Klay Thompson and Draymond Green, got off the buses, the dark clouds above began to leak. Before the players could reach their work stations, the light rain turned to a heavy downpour. Players and volunteers grabbed ponchos and headed to the different stations anyway. Curry took shelter beneath a tent before helping construct the playground’s basketball court. Later, Curry and Kerr assisted younger volunteers in using bright-colored paints to fill in a map of the United States near the school’s walkway, a project that Kerr noted as one of his favorite parts of the day. 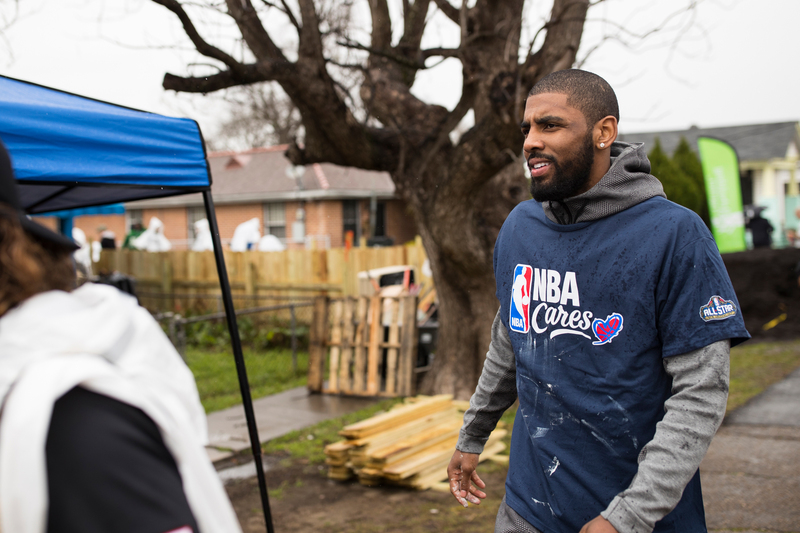 Kyrie Irving exits a volunteer event helping to refurbish homes and plant a community garden in New Orleansí Hollygrove-Dixon neighborhood. NBA players volunteer their time to help better the New Orleans community through the NBA Cares program. Players and volunteers applied mulch, mixed cement, painted and patched. Jordan and Cousins worked together building picnic tables and put on a show for the crowd. Jordan focused intently on getting the measurements of the tabletop correct, as Cousins jokingly critiqued his work. Jordan sat on the creaking pieces of wood to test the duo’s masterpiece. While struggling to fit his long legs beneath it, he wondered if the students would need more room. He’d have a point if all the students were 6 feet 11 inches tall like himself. After completing their projects, the players and coaches went to meet with kids in a classroom.